ZACINTO (GB) (Bay 2006-Stud 2012). 3 wins-1 at 2-at 7f, 1m, Goodwood Celebration Mile, Gr.2. Out of SP Ithaca. Sire of 71 rnrs, 37 wnrs, inc. SW Ugo Foscolo (New Zealand Two Thousand Guineas, Gr.1), Secret Allure, Vassilator, Odeon, Zigwig, SP Son of Zac and of Navagio, Shadow King, Wize Act, Zawhip, Aerohappiness, Not Usual Talent, Charlie Horse, Monrecour, Namjong Plus, Pickup, Strowan, Zakynthos, Banstead, Into Rio, High Distinction, etc. VASSILATOR (c. by Zacinto). 2 wins. See below. Sparkling Dragon. 3 wins at 1200m, 1400m, HK$2,181,200, to 2018-19, HKJC Granville H., Wong Chuk Hang H., Panasonic OLED TV H., 3d HKJC Griffin Trophy. Light Em Up. 3 wins from 1600m to 2100m to 2017-18, Manawatu RC Patton Engineering H., 2d Taranaki RC New Plymouth Motorcycle Centre H.
Shining Light (Star Way). 3 wins. See above. Manaia Rose. 2 wins at 1200m, 2d BOP RC Zest H., JL Mills Builders H., Rotorua RC Craig Thom Memorial H., Vistamax LED Screens H., 3d BOP RC Triton Pacific Owens P.
Winner of Winners - Big Shot (Mal.). Winner at 1600m in Malaysia, 3d MVRC Christmas at the Valley P.
Slinkymalinki. Winner at 1400m in NZ. Flying Victory. Placed, 3d Saint-Cloud Prix de Palaiseau. STAR TOUCH (Touching Wood). 5 wins-2 at 2-to 1500m, 540,950fr., US$203,380, Laurel General George S., Gr.2, Deauville Prix des Yearlings, L, Pimlico Maryland City H., L, 3d Longchamp Prix de la Salamandre, Gr.1, Prix Greffulhe, Gr.2, Prix du Rond-Point, Gr.3, 4th Longchamp Poule d'Essai des Poulains, Gr.1. Star Beam (Baillamont). Winner at 1600m, Maisons-Laffitte Prix Sanctus, 3d Evry Prix Matchem, L.
Shorthand - Born to Win (H.K.). 6 wins from 1000m to 1800m, HK$4,888,520, HKJC Canberra H., Duddell H., Po Yee H., South China Sea P., 2d HKJC Kwangtung Cup, American Club H., Hennessy H., Xinjiang H., Shenzhen H., Denver H.
Shining Change. Winner. See above. Short Silver. 5 wins from 2000m to 2400m in France. Star Change. 4 wins-1 at 2-from 1250m to 2200m in France. Producer. Short Order. 2 wins-1 at 2-at 1500m, 1600m in France. Stendhalien. 5 wins from 1600m to 2200m, Chantilly Prix de Malgenest, Prix de Rully, 3d Deauville Prix de la Dorette. Sharp Spring. 3 wins from 1600m to 1800m, 2d Deauville Prix du Hameau Perre, 3d Saint-Cloud Prix de Villaroche, Prix Always Earnest, Deauville Prix de Balme. Sziget. 2 wins at 2100m, 2900m, Saint-Cloud Prix des Pyrenees Atlantiques, 3d Deauville Prix Etalon Mawatheeq au Haras du Thenney. Corps a Corps. 2 wins at 2700m, Chantilly Prix de Route des Genets, 2d Deauville Prix Mujahid, 3d Deauville Prix de Brucourt. Sckheyl. 6 wins-1 at 2-to 1500m, Rome Premio Ladislao d'Angio. Nata's Jam. Winner at 2, Milan Premio Gozzano, 3d Milan Premio Alessandro Sambruna, Premio Anzano Al Parco. Dedo. 2 wins at 2, 2d Curragh Scurry H., Keatley Equine Groundcare H., 3d Curragh Boylepoker.com H., Leopardstown Heather Road H.
Race Record: 9 Starts 2-1-0 A$500,575. 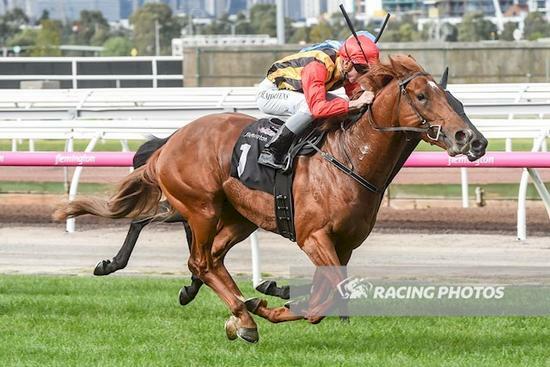 2 wins at 2, A$500,575, in 2017-18, VRC Anzac Day S., L, G Watson Hall of Fame 2YO Trophy, 2d MRC Caulfield Guineas, Gr.1.